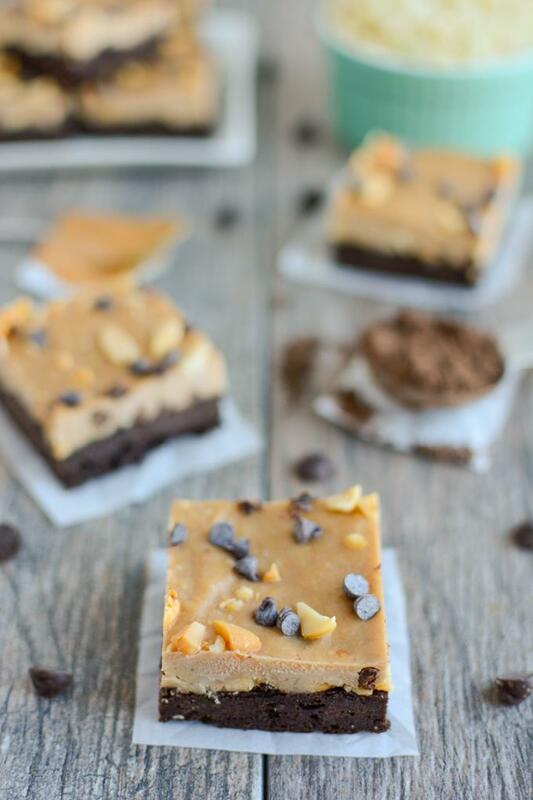 These dairy-free Frozen Layered Brownie Bars are perfect for dessert or an afternoon treat! They pair a layer of sweet potato brownies and a layer of peanut butter banana cream and even sneak in some cauliflower! Thanks to Elmhurst™ for sponsoring this post. Allow me to introduce you to your new favorite treat. These Frozen Layered Brownie Bars are actually two delicious desserts in one. 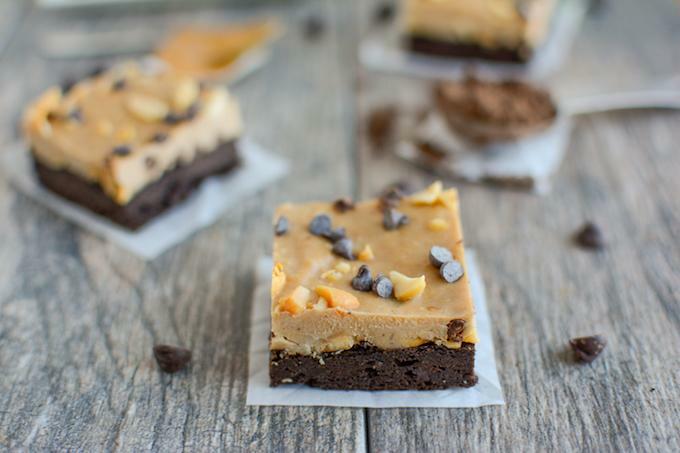 The bottom layer is a sweet potato brownie (a spin on this recipe) and the top layer is a creamy dairy-free blend of Elmhurst Milked Cashews™, peanut butter, bananas and, gasp, cauliflower. That’s right, I put sweet potatoes and cauliflower in your dessert and you’re going to love it! I’m not really sure how this idea filtered its way into my brain, but I’m oh so glad it did. While it may be hard to believe here in Ohio, warm weather IS coming. And there’s nothing better than a cold treat on a hot day, am I right? 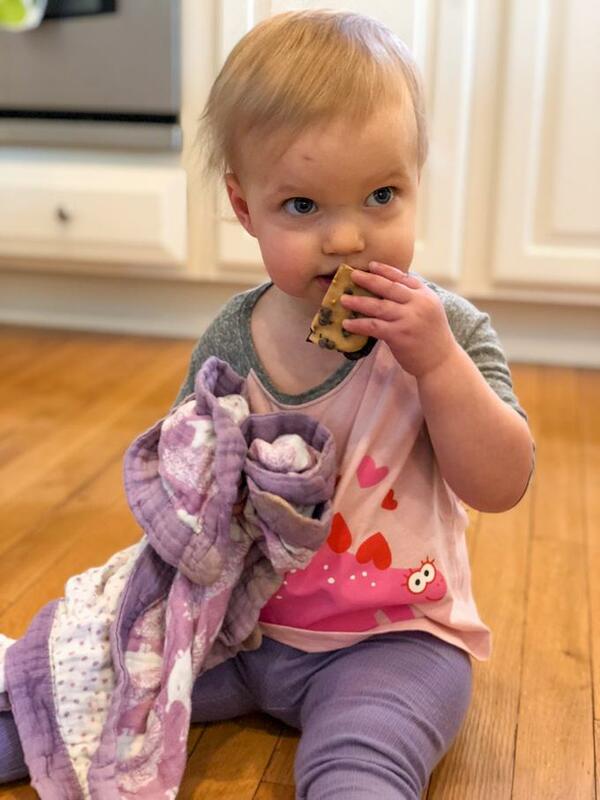 As I’ve mentioned a few times, especially if you follow me on social media, both my kids are currently having a little trouble with dairy products. They cause eczema flare-ups for Little Miss and constipation issues for Squish…so I’ve been trying to limit them. 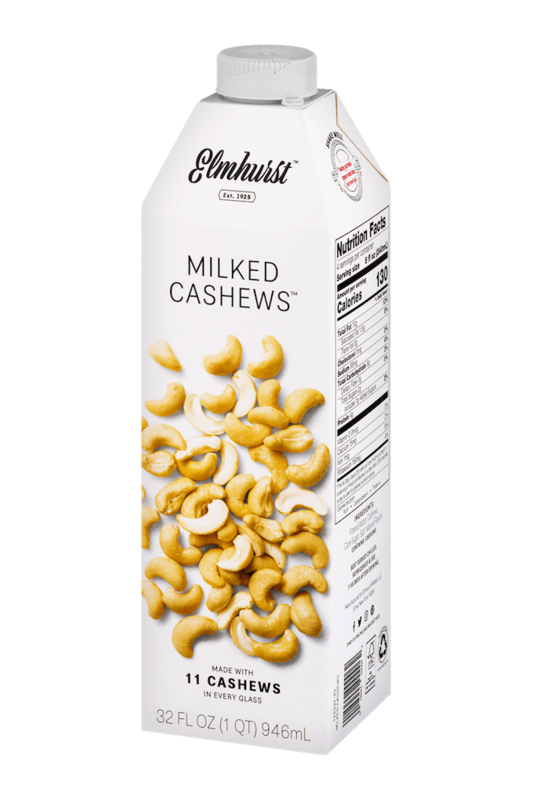 We’ve been trying out some different plant-based milk beverages lately and have fallen in love with Elmhurst Milked. They have both nutmilks (almond, cashew, hazelnut, walnut and peanut) and grainmilks (oats and brown rice) and I’m so in love with their simple ingredient lists. They don’t use emulsifiers, stabilizers or thickeners and yet their products are so creamy and delicious thanks to their innovative process! They also offer both sweetened and unsweetened varieties. For this treat, I used the Milked Cashews ™, which has 4g of protein and 2g sugar per serving. In a high powered blender or food processor, combine ingredients for the brownie layer. Spread into a 9×9 pan lined with parchment paper (batter will be thick) and bake at 375 for 20 min. Clean the blender while brownie layer is baking. Then add remaining ingredients, except peanuts and chocolate chips, and process until smooth. Remove brownie layer and let cool 10 minutes. Sprinkle 1/4 cup chopped peanuts and chocolate chips on top. Top with banana layer and spread until evenly fills the whole pan. Sprinkle remaining peanuts and chocolate chips on top and freeze at least 4 hours or overnight. Remove from freezer and let sit for 5 minutes. Cut into pieces and store in airtight container in the freezer. These are best if you let them sit on the counter for 2-3 minutes for eating! Just a couple easy steps and these beauties can be in your freezer! Remember to use dairy-free chocolate chips if you need to keep this recipe dairy-free! Be sure to look for Elmhurst Milked products at a store near you or order any variety through their online shop so you can give them a try for yourself! And follow them on Facebook, Twitter, Pinterest and Instagram for more great ideas! Cannot wait to make these! I love how you been adding vegetables to your baked goods! I made your chocolate pea cookies the other day – so good! I like all of the hidden veggies in these! Perfect for picky kiddos!